I tested my comprehension while watching 15 minutes of a random Chinese soap opera in Mandarin using the methodology described in my Week 51 post. Although this year I have picked up the pace with my Mandarin viewing (and listening), I often wonder if I am making real progress. 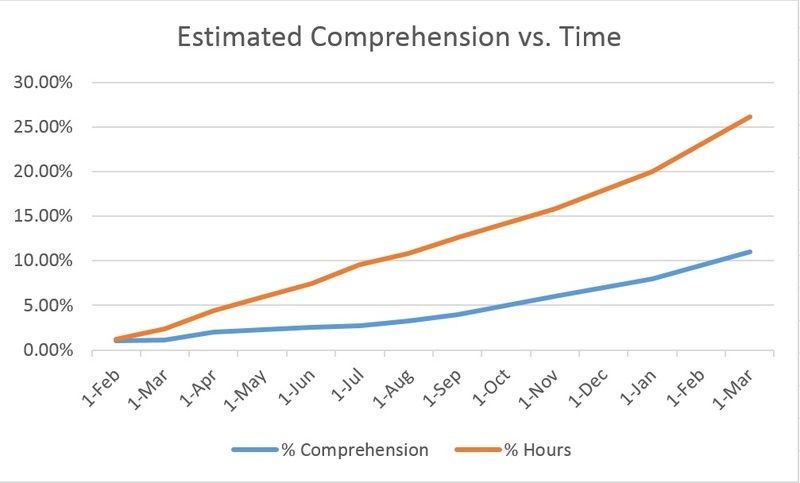 It was encouraging that the results—which are as objective as I can make them—suggest that my gains in comprehension are on track with my hours of listening. I estimated that during the 15 minutes of the soap opera, approximately 1,453 words were spoken, of which I definitely understood 166, including repeats (such as “wo,” which means “I”). I believe this estimate is conservative, considering my self-test methodology. I feel confident in stating that I now understand about 11% of words spoken in Mandarin in the Singaporean soap opera Tale of Two Cities, and I expect this is representative of what I would understand in day-to-day standard Mandarin conversation. This level of understanding, while far from true comprehension, is sufficient to allow me to understand more of what is happening in most situations than I would have a 14 months ago, before beginning to learn Mandarin. I am at 26% of my experiment time, or 313 hours. 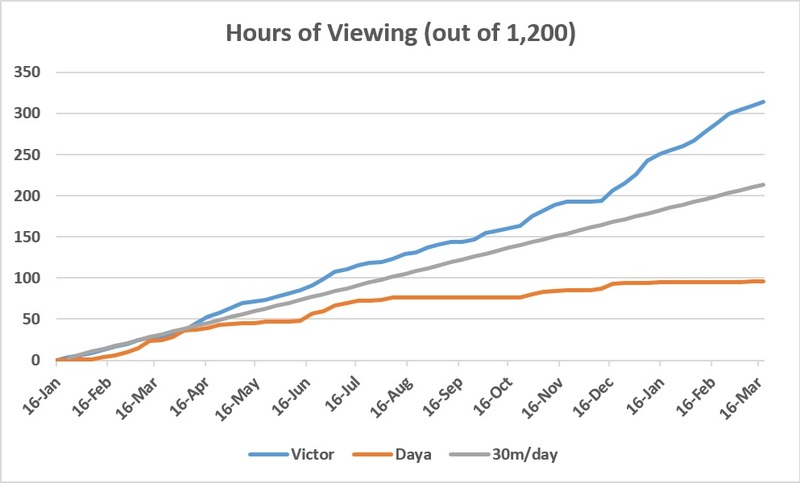 As the following graph illustrates, I have been squeezing more and more Mandarin viewing time into my days, especially since mid-December (due to how much I enjoy my experiment). This trend may be slightly reversed, as I have started my Law classes again. On the other hand, incorporating music while driving into my experiment allows me to put in more time. The graph seems to show my daughter teetering off and giving up on the experiment. Fortunately, that is not true. In fact, I believe she may have settled into a long-term participation in the experiment, in which she puts in about 1/4 of the hours that I do. She calls it “our experiment” (I melt inside) and we have tons of fun. Basically, she listens to music with me in the car, watches Boonie Bears with me some evenings, and every once in a while we watch part of a movie in Mandarin, usually a dubbed Disney film. An example of stubborn persistence (hopefully not stupid obstinacy)! Getting back to my test, I’m very glad I did it because it has given me renewed confidence to stay the course. My results during the first few minutes were over 15%, but then gradually dropped down to 11.27%, which I rounded down to 11%. I think this drop may be due in part to simply getting lazier about jotting down words as the 15 minutes dragged on. This difficulty in jotting down words is one of the reasons I believe 11% is actually a conservative estimate. I am hopeful that after another 47 hours of listening, having reached 360 hours or the 30%-mark of my experiment, I will score above 12%, keeping pace with the first 240 hours, which took me to 8% comprehension.